One of my ongoing research areas is what to cover a skin on frame boat with other than industrial fabrics sealed with modern sealants. Yes, there are animal skins, and I know that people have covered their boats with cow hides, but you see, we live in an industrial society and the imaginary scenario I am creating for myself is that the factories have shut down and one has to operate as boat builders of old did, that is, to find boat building materials in their immediate surroundings. Perhaps we have to broaden our definition of skin on frame a bit and allow a boat where the skin is the main structural material and the frame is of secondary importance. 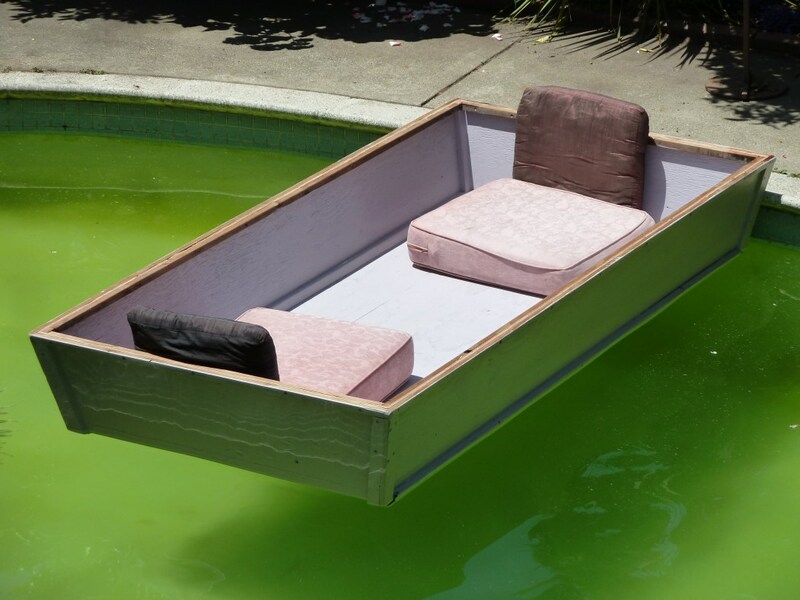 Enter the plywood boat. In my case, not a boat exactly but a plywood pool punt. The main idea was to not spend a lot of money. The secondary idea was to provide a stable lounging platform for a pool in an environment that is too cold for swimming for most of the year. Here is the punt under construction. 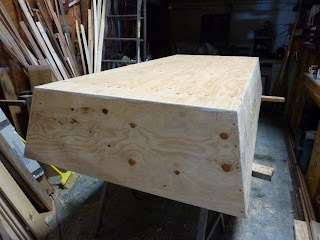 One sheet of plywood formed the bottom, another formed the sides. Height of the sides was just a bit under 16 inches. Early trials established that 16 inch sides were too high so I trimmed them down to 13. Perfect. The sheets of plywood are screwed to battens inside the punt for additional support. Water proofing of the screw holes courtesy of 3M 5200. Water proofing of the seams was done with a layer of glass adhered by epoxy. Initial trials also established that the sides of the pool abraded the fiberglass that I sealed the seams with so I added some wooden bumpers at the corners and some skid rails at the bottom for dragging the punt in and out of the pool. Then a few coats of gray paint from a five gallon bucket that a friend was tossing away, or rather, giving away. And oh yes, we realize that the pool is greener than it should be. The same day we launched the new improved punt we also ran into a small futon and some quilts that a neighbor was discarding. These are now lining the bottom of the punt. Very comfortable and stable to boot for someone used to sitting in narrow kayaks. Sometimes it is OK to trade speed for comfort. I am very impressed by your quality work . Thanks for sharing a nice information. 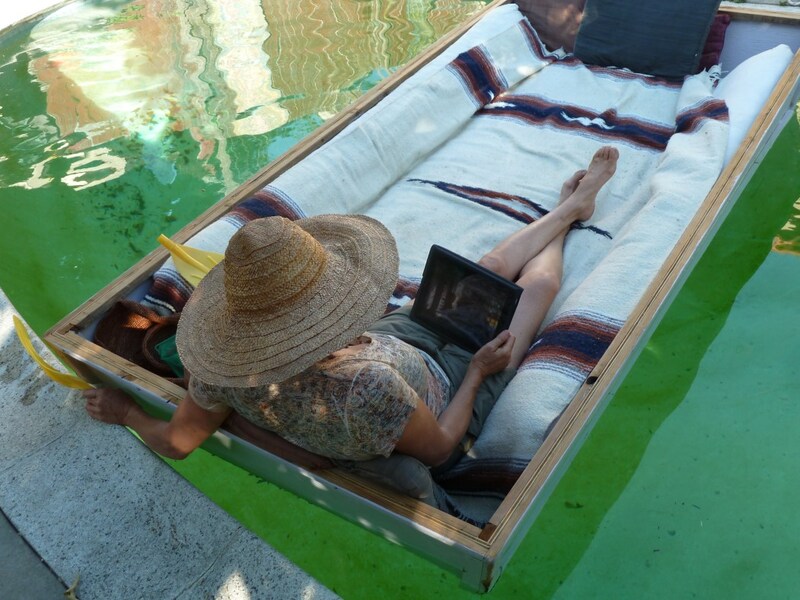 if at first, this floating box looked a bit uneasy in a kidney pool, it was actually divined to lounge in it a chilled glass of wine in hand. It rocked it's passengers in great comfort while drifting a few feet around. loved it!